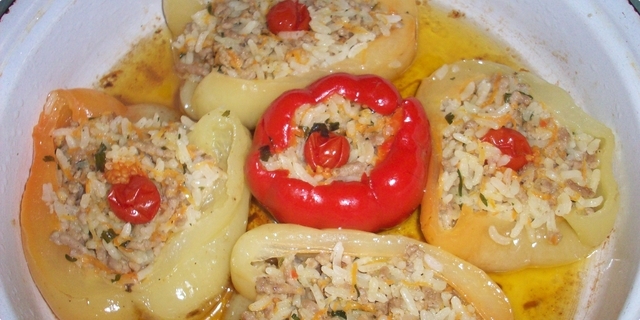 A traditional Serbian recipe for a classic dish of peppers stuffed with meat and vegetables. Again, there are many variations of stuffed peppers across Serbia but here is the basic recipe that you could modify by taste. Fry finely chopped onions and sliced carrots on 5 tbsp of oil at high temperature. After a few minutes add a mince meet. Add salt, pepper to taste and continue to fry it for another 5 minute pressing the meet with your spoon to make pieces smaller. Take it off the heat and add rice and an egg. Stir well the mixture. Carefully spoon the mixture into the peppers to 2/3 of its height. Cover the top of each paprika with a slice of a potato or tomato, depending on a taste. Place the filled peppers in a big pot or a deep pen. In the saucepan, heat 5 tablespoons of oil and add 2 tablespoons of flour and stir it for about 3 min. Quickly stir in the minced garlic and ground red paprika. Mix to a thin paste. Add the saucepan content to the pot with paprika, add tomato juice or paste and cover it with the water. Add a little bit of Vegeta if wanted and sprinkle chopped parsley on the top. Put the pot into the oven and leave it for 1 hour on the 250 degrees Celsius. You can also choose to boil it at low temperature for 40-45 minutes.